*For the service parts, the grade for fitting cannot be selected between a piston pin and a connecting rod. (Only 0 grade is available.) The information at the shipment from the plant is described as a reference. This grade cannot apply to reused parts. For details of the measurement method of each part, the reuse standards, and the selection method of the selective fitting parts, follow the applicable procedures. 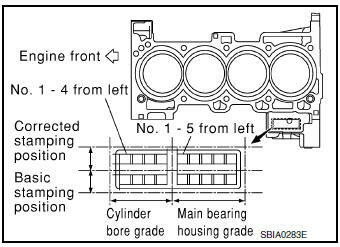 Check the cylinder bore grade on rear left side of cylinder block, and select a piston of the same grade. If there is a corrected stamp mark on the cylinder block, use it as a correct reference. Measure the cylinder block bore inner diameter. Determine the bore grade by comparing the measurement with the values under the cylinder bore inner diameter of the "Piston Selection Table". Select the piston of the same grade. 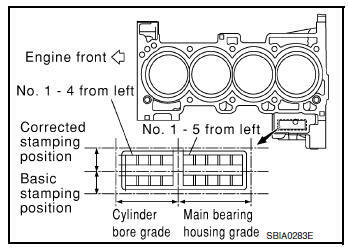 For the piston selection table, refer to EM-120, "Cylinder Block". The piston is available together with piston pin as an assembly. The piston pin (piston pin bore) grade is provided only for the parts installed at the plant. For service parts, no grades can be selected. Only 0 grade is available. Apply big end inside diameter grade stamped on connecting rod side face to the row in the "Connecting Rod Bearing Selection Table". 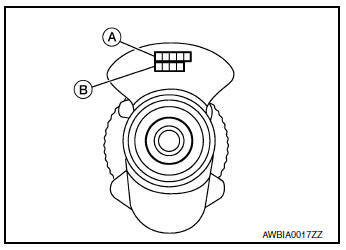 Apply pin diameter grade (B) stamped on crankshaft front side to the column in the "Connecting Rod Bearing Selection Table". 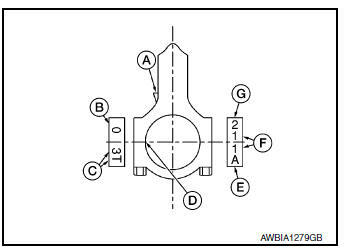 Read the symbol at the cross point of selected row and column in the "Connecting Rod Bearing Selection Table". 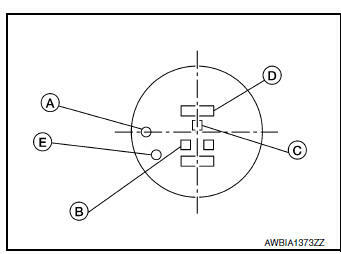 Apply the symbol obtained to connecting rod bearing grade table to select. Measure dimensions of the big end inner diameter of connecting rod and outer diameter of crankshaft pin individually. 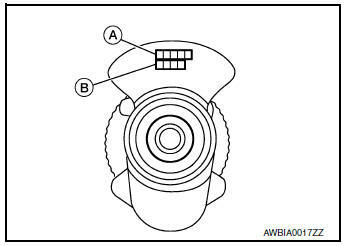 Apply the dimension measured to the "Connecting Rod Bearing Selection Table" below. Connecting Rod Bearing Grade Table. Refer to EM-125, "Connecting Rod Bearing". When the specified oil clearance is not obtained with standard size connecting rod bearing, use undersize (US) bearing. When using undersize bearing, measure the bearing inner diameter with bearing installed, and grind the crankshaft pin so that the oil clearance satisfies the standard. CAUTION: In grinding the crankshaft pin to use undersize bearings, do not damage the fillet R (All crankshaft pins). "Main Bearing Selection Table" rows correspond to bearing housing grade on rear left side of cylinder block. Apply journal diameter grade (A) stamped on crankshaft front side to column in "Main Bearing Selection Table". Find value at crossing of row and column in "Main Bearing Selection Table". There are two main bearing selection tables. One is for odd-numbered journals (1, 3, and 5) and the other is for even-numbered journals (2 and 4). Make certain to use the appropriate table. This is due to differences in the specified clearances. Apply the symbol obtained to "Main Bearing Grade Table" to select. Service parts are available as a set of both upper and lower. Measure inner diameter of cylinder block main bearing housing and outer diameter of crankshaft journal. Apply measurement in above step 1 to the "Main Bearing Selection Table". Follow steps 3 and 4 in "When New Cylinder Block and Crankshaft are Used". Main Bearing Grade Table (All Journals) Refer to EM-123, "Main Bearing". Use undersize (U.S.) bearing when oil clearance with standard size main bearing is not within specification. When using undersize (U.S.) bearing, measure the bearing inner diameter with the bearing installed and grind journal until oil clearance falls within specification. CAUTION: Do not damage fillet R when grinding crankshaft journal in order to use an undersize bearing (all journals).